Re-skilling has become the core subject of discussion for people managers in organizations in the present times. A vast majority of them believe that it is always fruitful to invest in an existing resource rather than in recruiting new people. Gone are the days when companies could roll out one-size-fits-all training programs and expect to see good results. To be effective, the experience needs to be as individualized as each worker and as dynamic as the evolving roles. And advances need to come faster, with significant buy-in from those who will ultimately be responsible for skills: employees. 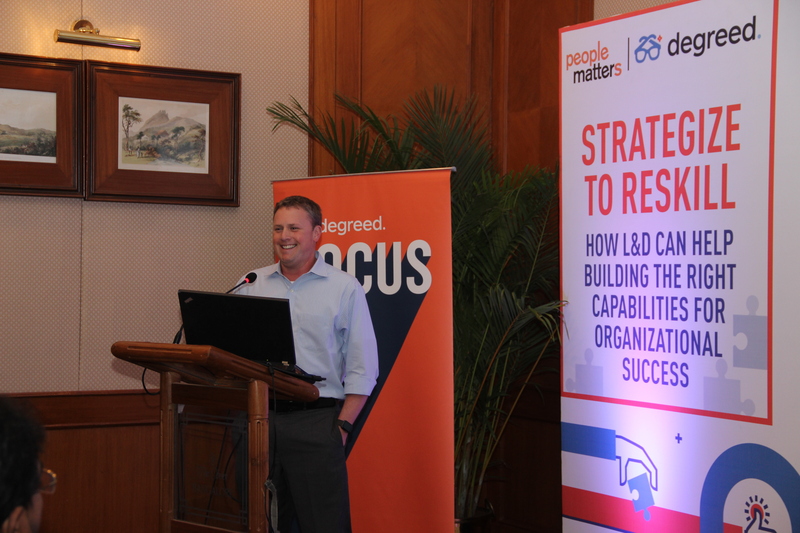 Many senior HR industry leaders gathered in the latest roundtable organized by People Matters in partnership with Degreed to share their views on how to 'Strategize to Reskill: How L&D can help building the capabilities for organizations success’. The industry leaders covered some key points such as the importance of re-skilling, navigating the challenges of reskilling and how to align re-skilling to the businesses. Re-invent, challenges, upskilling, innovate, change, fundamentals, customize, experience, energy, positive, automation, passion are the first words that popped in the minds of HR heads when they began the discussion. Further, quoting ManpowerGroup’s Talent Shortage Survey 2018, Chris said, around 56% of employers in India are facing difficulty in filling vacant positions, making India among the top 10 most-affected markets in the talent shortage. The learning platform’s CEO batted for re-skilling and shared that the ecosystem is vast and expanding, and it’s the best time to be in a career as re-skilling is in demand and one can unlock a better position and growth in the organization. Experts feel that job opening is outpacing workers and job mobility is increasing. On one hand, we have enough skills, but the challenge is we don’t have an effective mechanism to measure those skills. He said, careers have become longer, tenure is shorter in jobs, but skill development is the key growth driver. 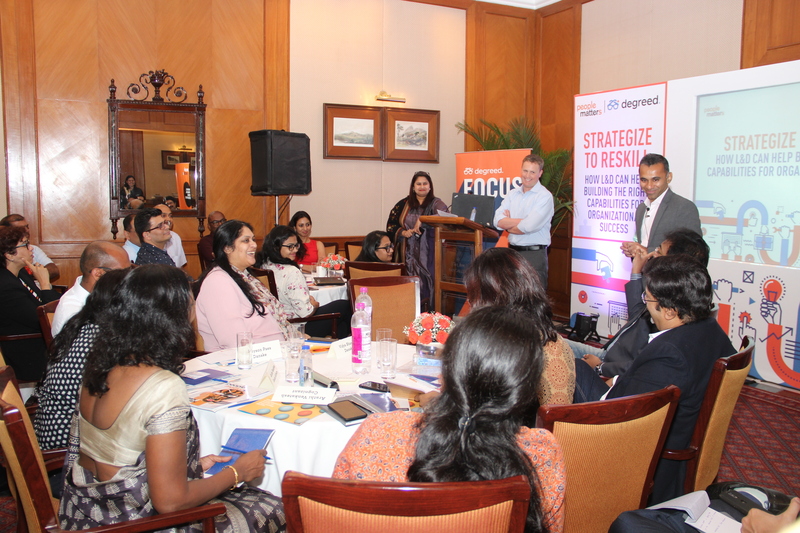 Addressing the HR leaders present in the discussion, he shared that the chief of people should come up with a solution about re-skilling the workforce and aligns it with the business strategy. Industry experts also believe that if employees get empowered, they can keep up with the pace, innovation, and change which is happening around. 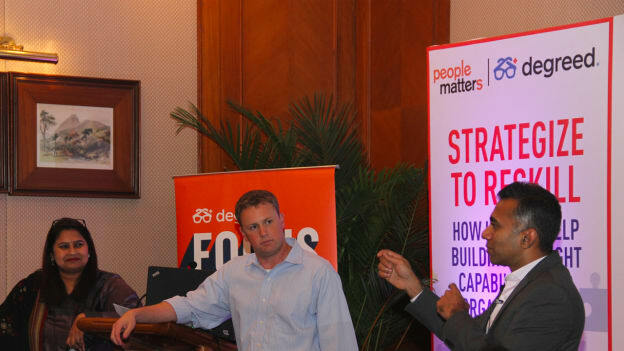 And companies should align the people’s skill with the business strategy. This is how they will outperform. In another keynote session, Hariraj Vijayakumar, Founder & CEO, Designs in Change raised key points on the importance of reskilling. He suggested the role the leaders and managers play to re-skill the team. According to Vijayakumar apart from the employees, the leaders are equally responsible for re-skilling the workforce. Because a leader is aware of the strength and the weakness of the team and it’s their responsibility to consolidate the team as necessary. Chris feels if the HR heads and the CEOs will have access to the skill sets of the employees, their skill gaps, and their essential skills, then they can enhance those with the tools and techniques which will become a game changer. Some of the industry experts present in the discussion felt that re-skilling is highly valuable because it helps fight attrition. Also, the millennial workforce is upbeat about their skill sets and are hungry about new learnings. Experts believe if they can re-skill the workers they can retain them in the organization and deploy them to the demand that is required. However, when asked about the return on investment (ROI) that is involved, all the senior leaders agreed on the point that ROI shouldn’t be measured but only 'impact' should be considered. NEXT STORY: How will Asian automakers restructure talent post-Brexit?